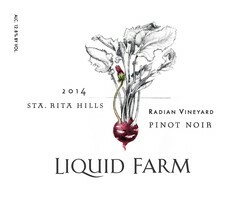 Radian Vineyard is the westernmost vineyard along Santa Rosa Rd, in the heart of Sta. Rita Hills. Cold nights and a constant marine influence makes this site ideal for expressive and balanced Pinot Noir. In 2016, we identified 3 barrels that set themselves apart and we bottled our second "single-vineyard" Pinot Noir from Radian Vineyard. Aged 15 months in French oak (15% new) with 15% stem inclusion. While she sure is showy now, expect great things as this wine matures over the next decade.